The coat of arms consists of a shield upon an archiepiscopal cross (i.e. a cross with two horizontal arms, the upper arm shorter than the lower) and crosier (bishop’s pastoral staff) crossed over each other. The shield is surmounted by a mitre (bishop's liturgical headdress). 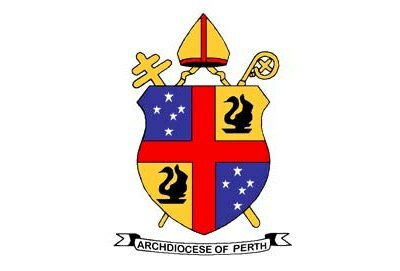 The mitre and crosier are standard ecclesiastical heraldic devices indicating the coat of arms is that of a diocese; the archiepiscopal cross indicates the diocese has the status of an archdiocese. The red cross upon the shield divides it quarterly. The first and fourth quarters display the constellation of the Southern Cross (symbol for Australia) on a blue background, and the second and third quarters display the black swan on a gold background (state emblem and colours for Western Australia).